Chatbots improve the conversion rate and workflow in many areas of a company. Support and Customer Service – Many support questions can be easily answered with a chatbot. Chatbots allow live support people to handle more difficult questions that require a human touch. More importantly, the user is immediately satisfied by getting an answer to their question 24/7. If a question is too difficult for the chatbot to answer, the bot can switch the user to a live chat with a human, or transfer the user to a live phone call. A virtual assistant chatbot answers these questions in a conversational way, and the user’s questions are collected and evaluated to improve your support department. Lead generation – The sales process for any product or service can be complex. From the prospect’s view, they want to know if the product or service will match their use case and price. From the company’s viewpoint, the sales person wants to qualify the prospect to understand if the prospect’s use case and budget are a good match for their product or service. Good lead gen chatbots ask questions to fill out a traditional form in a conversational way then send the lead to the companies CRM. Surveys – To know what your customers are thinking about, you have to ask them questions, and a survey is a useful tool for this type of data collection. A survey can be used inside a chatbot to engage users by asking questions in a conversational way such that the user does not know they are part of a survey. The user responds to the questions and the response is collected and stored to reveal new information about user preferences and behavior. The data collected from a survey chatbot is useful for future marketing and sales campaigns. Both of these conversion funnels have areas with high drop rates where users leave the site. In the first funnel, the user may have questions about the product. This process is solved with an ecommerce chatbot directing the user to a product quickly, as well as upselling other products that go along with it. Over time, the bot can track what was purchased in the past and provide suggestions that coincide with the user’s likes and desires. In the second funnel, the user may have questions about taxes, shipping, coupons, return policy, etc. Ecommerce sites have higher conversion rates when chatbots are answering questions and overcoming obstacles. Ecommerce sites using Ochatbot have a 15% to 35% increase is revenue when using the chatbot. Overall website conversion rate is improved because the user experience is more engaging and helpful than a list of pages on a website. A chatbot works like a store employee who comes up to you at the store and offers assistance. As more and more websites start using chatbots, your customers and prospects will expect a certain level of service from a site and chatbot. This is especially true because the number of mobile users is still increasing and viewing large sites on a phone is difficult. The concept of clicking multiple pages on a site to find information compared to asking a question and immediately getting an answer will soon be outdated. 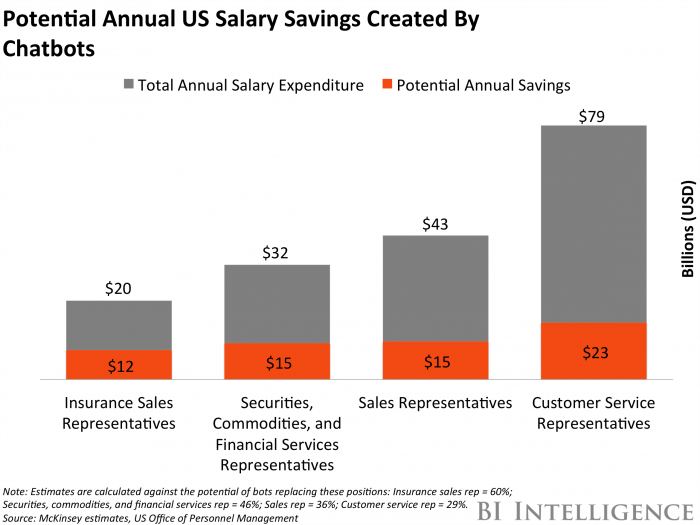 By 2020, 88% of brands will have implemented automation technologies in sales, marketing and customer service. They can leave the conversation and not feel guilty about offending the bot. There are many estimates about how chatbots will affect the workforce. Some of these estimates are pure speculation. I predict that chatbots will not replace a human’s job, but will improve the overall customer service experience. When human sales and support handle higher level questions, it means the humans are focusing more on sales and less on pre-qualifying. How often do you get an email that you never open? You read the subject line and delete the message without opening it. Over 97% of emails are treated this way. In contrast, how often do you open a Facebook Messenger notification? The open rate is huge compared to email. The average MailChimp email campaign has a 10% open rate and a 2% conversion rate where the user clicks through to the website. A Facebook Messenger notification has a 1,400% engagement rate, which means a significant number of users open a Messenger notification, click the link inside the message, and visit the company’s website. I remember my first email campaign in 1994 had a 40% open rate! I was ecstatic! However, although social messaging has a high conversion rate now, it will decrease over time as users get hit with more spam. Right now, every message is from a trusted friend and very few messages are solicitations. Although the numbers look great now, they will normalize over time. That said, I still think the conversion rate will be better than email for the very fact that you can correspond in real time, which email cannot do. A survey via a chatbot showed 3X more conversion than over email. 45.8% would rather contact a business through messaging than email. That red icon on your Facebook Messenger app will sit there until you open it, which means it’s difficult to ignore. People associate email with junk or spam, which means they are in the habit of deleting email without opening it. There are very few brands on Messenger, which means a message is likely from someone you know. People open messages from people they know. It takes a millisecond to open a Facebook Messenger notification, which is much faster than opening an email. It only takes two finger taps to click through a Messenger notification, whereas email requires a lot more navigation steps. Facebook Messenger is becoming one of the best alternative content delivery systems out there, which is something marketing folks have been searching for as a replacement for email. Email is still a strong marketing tool, but it is declining as email systems become smarter. For example, Google’s Gmail automatically removes email or routes it to spam, and it moves email to different buckets such as social, promotions or updates. When a Gmail user moves a message from one bucket to another, the system remembers that action and repeats it in the future. One thing to keep in mind is not everyone uses Facebook, and those that do use it don’t necessarily use Facebook Messenger. The number of users on Facebook may not be using the network on a daily basis and may not be using Messenger at all. What industries are using chatbots? Every industry will benefit from a chatbot. Some of the larger industries are already spending a huge amount of resources to add chatbots to their websites and social platforms. For example, Amazon has over 1000 engineers working on chatbots, artificial intelligence and machine learning for all of their services. The chart below shows some of the major industries and their projected growth. 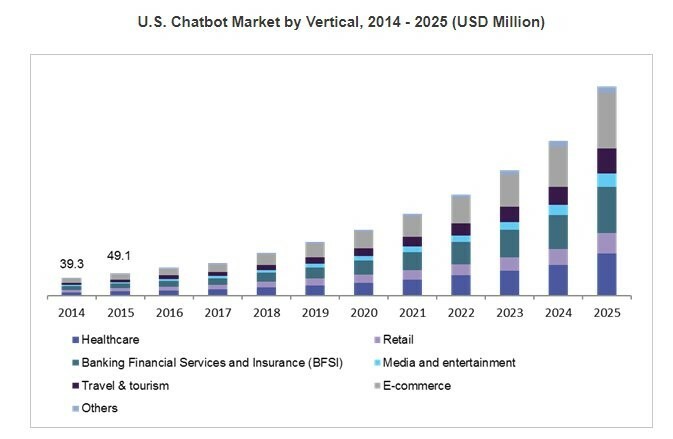 This does not mean you have to spend a lot of money on a chatbot. A simple chatbot can be built for a site for $30 a month, or a complete chatbot system with maintenance for $500 a month. Over time as you collect data, you can expand on the intelligence of the bot to answer more questions or generate different types of leads and sales.